ARMY families have been unearthing some ancient treasures in projects run by Wessex Archaeology. Budding archaeologists of all ages got stuck in to Project Florence, where Army families from garrisons around Salisbury Plain took part in activities in a thirteen-month programme. The work, around the Barrow Clump site in South Wiltshire, gave local volunteers and children a chance to learn new skills, and complemented Operation Nightingale, a military recovery initiative for injured soldiers. 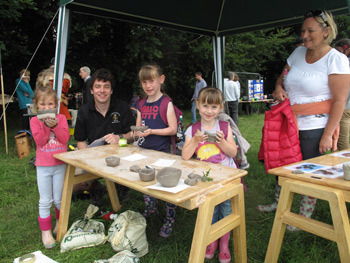 Families enjoyed activity days, guided tours of the site and got hands-on with clay pot making, games, podcast recording and processing excavation finds. The Playing with the Past archaeology club for 8-16 year olds was also set up with the Army Welfare Service in Bulford, giving Service youngsters a chance to explore their local heritage and develop their creative talents. They built Neolithic houses, discovered underwater archaeology and partied Victorian style!